An eleven-person international delegation, including U.S. and Canadian human rights observers and a journalist with The Nation, visited various regions of Honduras from August 11- 20, 2014, receiving testimony of human rights violations and conducting interviews. Members of the Honduras Solidarity Network, which consists of over thirty organizations from the United States, were part of the delegation. 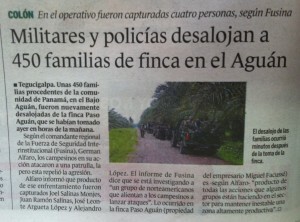 violations attributed to Honduran state forces and the Dinant Corporation. These violations, based on first-hand testimonies of victims, included a violent eviction of the community La Panamá by the Honduran military on July 3, 2014 involving tear gas, live bullets, and physical aggression in public spaces in close proximity to houses and schools. One man was killed, two were gravely injured, various were beaten, and seven were detained inside their homes, charged, and later released. Various testimonies also drew attention to the direct role of the Honduran military in guarding private land claimed by Dinant blurring the lines between the role of Honduran state forces and private security guards. 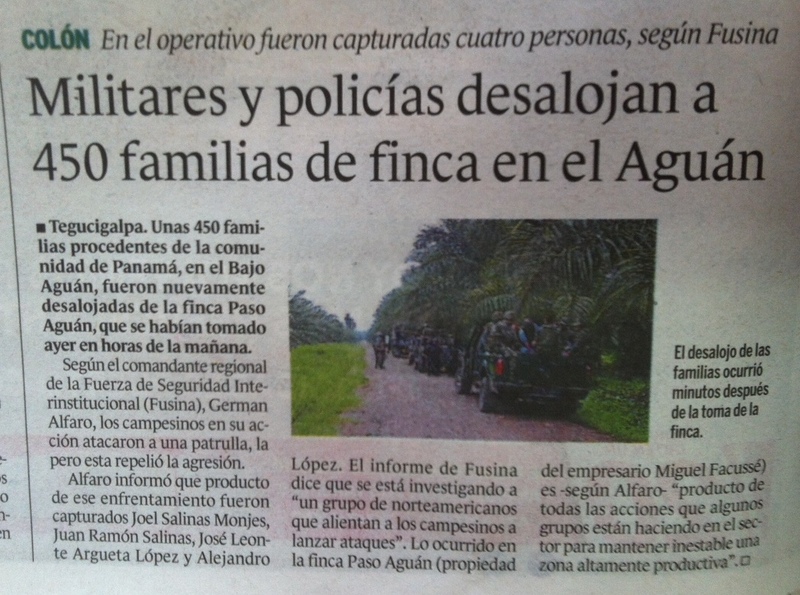 The day after our visit to the Aguán Valley, our delegation was accused by Coronel Germán Alfaro of FUSINA (National Inter-institutional Security Force) of “encouraging campesinos to launch attacks” and causing “instability” in the region. He also said the delegation was being investigated for being in “a practically restricted area of the country.” These accusations are similar to those made against human rights defender Annie Bird of Rights Action in December 2013 and July 2014 when Roger Pineda of Dinant and Coronel Alfaro accused Bird of “causing chaos” attempting to “destabilize” the Aguán region and, on a local television channel in Tocoa, Colon, accused Bird of conducting “illicit activities.” We denounce that these accusations and defamation in the press are part of a systemic effort to threaten, criminalize, and silence the documentation of human rights violations by national and international human rights observers, defenders, and journalists. The need to expose human rights violations in the Aguán Valley is urgent and the violations we heard while in La Panamá and the Aguán were similar to others that have been widely documented by human rights organizations such as Rights Action, Human Rights Watch, and the UN Working Group on the Use of Mercenaries. Over 100 campesinos have been killed in the Aguán Valley since 2009 and very few cases have been investigated and tried. Accusations of abuses and violations committed by Honduran state forces and Dinant against campesino communities in the Aguán also led the International Finance Corporation (IFC), the private arm of the World Bank, to initiate an internal audit of their 30 million dollar loan to Dinant. Additionally, during our visit to La Panamá on August 15, 2014, we heard gunshots in close proximity to where we were taking testimonies, and later discovered that four community members had been detained by the Honduran military. At this moment, we notified the US Embassy in Tegucigalpa of our location and concern for the safety of members of La Panamá. We were also deeply concerned for our safety particularly since international delegations have previously experienced intimidation by Dinant’s private security guards who fired shots at close range in the direction of delegates and the campesino community. 1. An immediate end to the campaign of criminalization and defamation against international and national human rights defenders and journalists in the Aguán and other regions of Honduras. 2. An end to all US aid to Honduran security forces, especially in light of the on-going and well-documented abuses of the Honduran military in La Panamá and the Aguán Valley. 3. That the Honduran-government appointed Unidad Especial de Investigacion de Muertes Violentas en el Bajo Aguán (Special Unit for the Investigation of Violent Deaths in the Lower Aguán) be accompanied by an independent, impartial, international commission with investigative and forensic experts in investigating assassinations and human rights abuses. Previous PostDeclaration for Justice for Child Refugees from Central AmericaNext PostSolidarity Action for Chabelo !